Hey, remember a few days ago when we looked at Metropolis Mailbag II? Well, that "II" wasn't just there for show... that story was a sorta-kinda sequel to the one we'll be discussing today. If you remember, in II, the heroes of the DC Universe went through Superman's super-mail... because the Man of Steel was quite dead at the time. Now, we're gonna see how the man himself takes requests. It's... not Christmas Eve (yet) and we open with Superman approaching the Metropolis Post Office. He thinks to himself that he'd rather deal with the likes of a supervillain rather than what he's about to face. 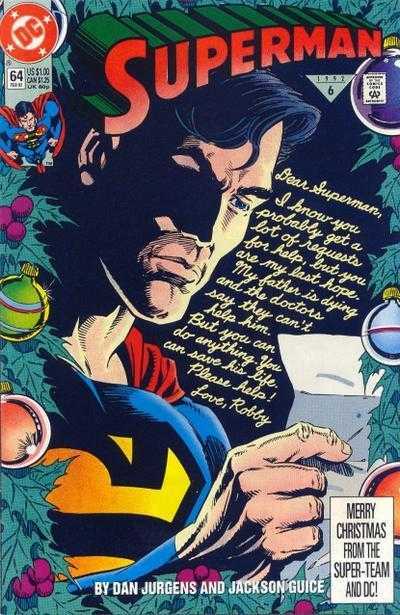 He meets with Willie Simpkins and special guest, Lois Lane as he hankers down to go about his Holiday tradition... answering some letters from the Metropolis Mailbag! Hundreds of thousands of letters from people all over the globe clog a very special room in the post office. After Willie leaves the pair alone, we start to see some of the requests made of the Man of Steel. We've got some get-rich-quick types... a kid asking him to squeeze coal into a diamond (which Superman claims not to be able to do... guess the George Reeves show is outta canon... maybe it's just pre-Crisis). He finally comes across a letter from a Holocaust survivor who spent time in Auschwitz. She currently lives in Chicago and just learned that she has a sister who also survived, living in the former East Germany. Her request is to see her one more time... Superman's got himself a gig. He heads off to Chi-town, and asks Mrs. Schommer to ready her passport... cuz they are Berlin-bound (or thereabouts... damned alliteration). After a transatlantic flight, he facilitates a sisterly reunion. Superman returns to the Metropolis Post Office, and is surprised to see that Lois is still reading letters. She finds one in particular that catches her eye... it's from a young lady who is in desperate need of a heart transplant. Superman picks up another letter... from a boy whose father has an inoperable tumor... and he wants Superman's help. Superman knows where he must go... but isn't sure what he's going to say when he gets there. Turns out to be a moot point. By the time he arrives, the father has already passed. As he is talking to the grieving widow, the boy who wrote the request enters the scene... and he is rather angry. Feeling as though Superman ignored his request, he lashes out. Superman does what he can to try and get through to the young fella, and as he makes a bit of headway they are interrupted by a doctor... who wants to know if the recently deceased is an organ donor. Superman, decides that there is a slight possibility that some good may come from this... and convinces the widow to donate. We shift scenes to a woman being rushed into the emergency room... for a heart transplant. Superman enters with the organ in question. Back at the Post Office, Lois and Clark share some take-out from Big Belly Burger and discuss the Daily Planet Christmas Eve Party for disadvantaged kids. This year, the budget didn't allow for any gifts. Luckily, Superman's got friends in high places, and so he tells Lois he's "got this". First stop, Emil Hamilton's lab... second call, Bruce Wayne. Later, Lois arrives at the party and calls for all the kids to assemble on the roof for a very special guest... Santa Claus! Superman has donned a completely black bodysuit and mask to hide the fact that he is giving ol' Chris Kringle the assist. The kids are overjoyed by the appearance of St. Nick, and job well done, Superman heads home for a long Winter's nap. At his apartment he is met by one last piece of mail... it's a wedding invitation... it seems as though his childhood friends Lana Lang and Pete Ross have decided to tie the knot! What a neat little story. I love the mix of Christmas stories we've been discussing here... some books just add a Holiday background to their regular stories... others, like this one, sorta-kinda take a "month off" to do a special issue. This was a great break from the action, and still allowed Superman to be... ya know, super. When I first read this I was expecting the standard "there are some things that even Superman can't do" type of story... and, ya know... there is a bit of that in here, but it doesn't really beat us over the head with it. Even in the one situation he could not "fix" in the tumor, he was able to pull out a small victory with the heart transplant. Overall, not a whole lot to say about this one... but it is quite good. Definitely a wonderful Christmas story, and worth your time if you are a Superman fan.